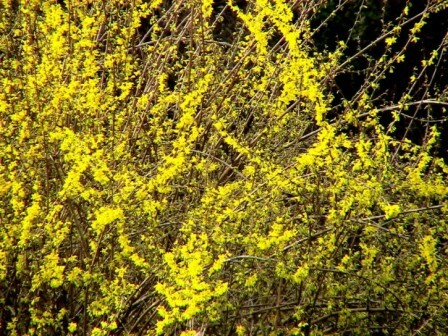 Forsythia X intermedia, forsythia or yellowbells, Zones 6-8.
various shades of yellow from pale to deep gold. They are perfect in combination with yellow daffodils and other early spring bulbs. Forsythias sort of fade into the background in the summer, but return to the stage in the autumn when they sometimes turn shades of burgundy to purple. The biggest mistake people make with forsythias is to prune them into stiff shapes. They look much more graceful if allowed to grow in their natural arching shape. If pruning is needed, just remove a few of the oldest canes from the base from time to time and trim back any irregular wayward branches. mass planting at Winterthur shows. They have the added benefit of having attractive blue-green foliage all summer that turns brilliant shades of orange to red in the fall. Dwarf means that they can grow to 5 - 6' as compared with F. major which grows to 6 -10'. Both are native American species. 'Mt. Airy' is a choice cultivar that is reliable for good fall color. Gardenia jasminoides, cape jasmine or gardenia, Zones 7b-10. Mid-spring to mid-summer gardenias blossom in profusion all over the South. They are often used around patios and pools where their heady perfume sweetens the air. 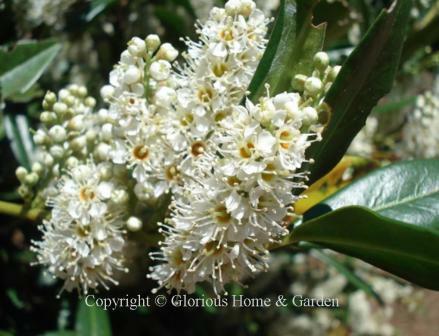 The buds unfurl into waxy white blooms set off by deep evergreen foliage. The drawbacks are the susceptibility to powdery mildew, white flies and other pests, and the fact that the yellowing spent blossoms can be somewhat messy. 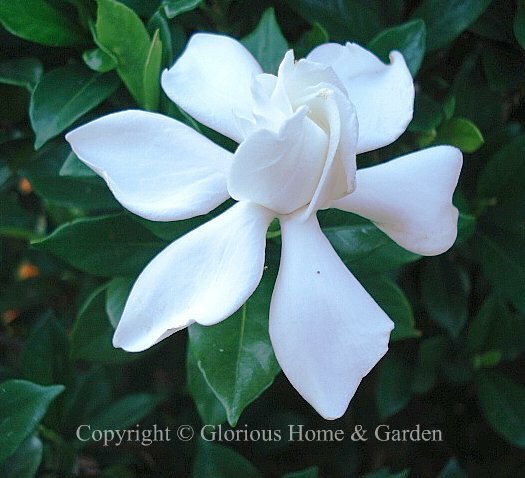 There are several different forms that make gardenia useful for various situations. 'Radicans' is a low-growing spreading shrub with smaller double flowers (heavy bloom in late May, early June with some repeat blooming in summer); 'Kleims's Hardy' has small, single daisy-like flowers that bloom only once in June (at least mine does); and 'August Beauty' is the large form that you typically associate with gardenias. It can reach 6' in height and repeats until October. 'August Beauty' is shown. 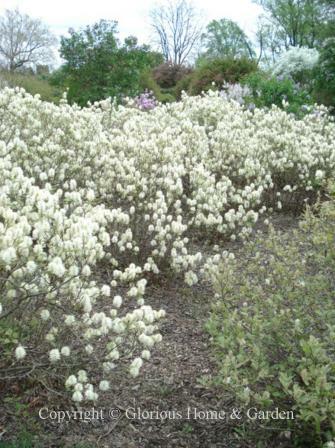 low-growing shrub or ground cover with long, pink flower racemes that give a sort of miniature wisteria effect. A nice ground cover for a partly shady situation, but be aware that it spreads via underground runners and could be invasive. 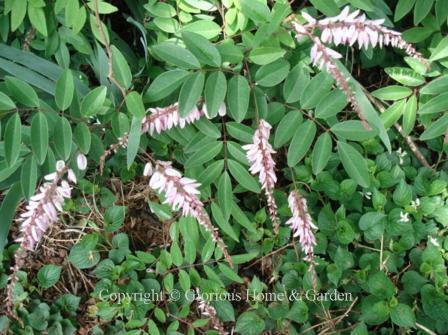 This is a relative of Indigofera tinctoria from which indigo dye is derived. flowers in spring and brilliant red fall color. 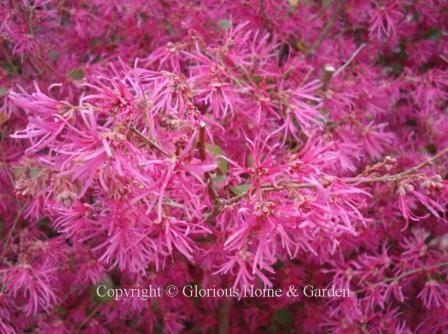 Virginia sweetspire likes moist soil and is adaptable to sun or shade. It will form large colonies through suckering where it is happy. moist, well-drained, acidic, humusy soil. 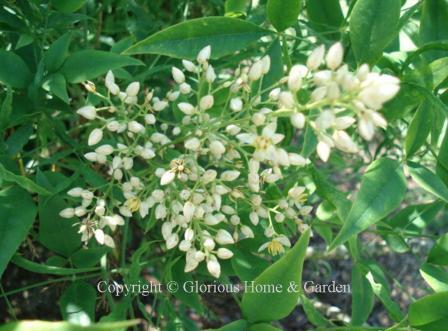 A great North American native evergreen shrub. lowers on slender green stems. Blooms for a long period and even repeats a bit in late summer. The double one below is 'Pleniflora.' Does well in part shade. Loropetalum chinense, Chinese fringe flower, Zones 7-9. Loropetalums have exploded in popularity lately and seem to have become the darlings of landscapers, one sees them everywhere in the Southeast. They bloom early from late winter into April in mostly screaming pink or fuchsia ribbony flowers (there are also white ones) that completely cover the evergreen foliage. There are green and purple-leaved types that are neat and tidy when out of bloom. Great for foundations or hedges, but like forsythia they have a better appearance when allowed their natural shape and not stiffly pruned. Nandina domestica, nandina or heavenly bamboo, Zones 6-9. 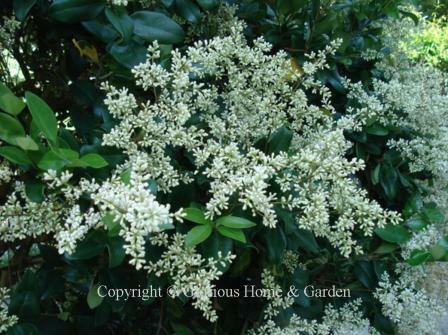 This shrub is appreciated more for the pendulous clusters of red berries in the fall and winter that for the flowers, but the airy white flower clusters foretell the show to come. Neviusia alabamensis, Alabama snow wreath, Zones 4-8. 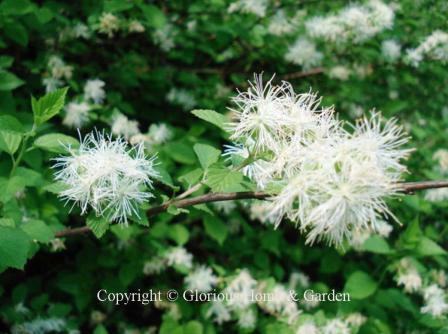 Snow wreath is a charming, little-known native spring-flowering shrub that is worth seeking out. Fuzzy white flowers (actually the stamens) that remind me of ageratum adorn the shrub in April to May. Nice in a shrub border, it grows to about 3’ x 6’. Philadelphus x virginalis, mockorange, Zones 4-8. 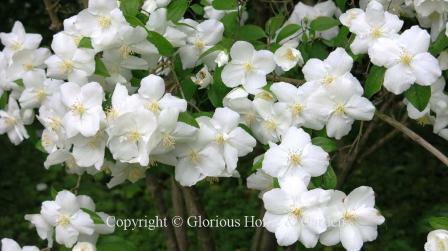 Mock orange is a spring flowering shrub grown for its fragrant, white blooms that cover it in May. 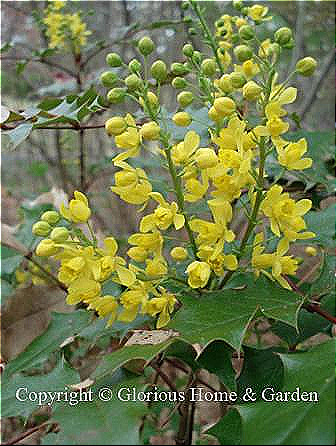 The cultivar, ‘Natchez,’ below, has larger flower than is typical and reaches about 6 to 8 feet. As mock orange is not particularly interesting out of bloom, and sort of fades into the background, place it accordingly as part of a shrub border, hedge, or screen. Still, for the time it does bloom, it puts on quite a show and fills the air with an orange blossom-like fragrance. Pieris japonica, Japanese pieris or lily-of-the-valley shrub, Zones 4b-7. 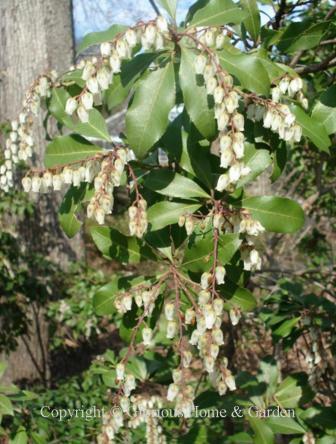 Pendant clusters of little urn-shaped bells in white or pink open in late winter to early spring on this evergreen shrub and are long-lasting. In fact, the buds, which form the previous summer almost make the shrub appear to be in bloom all winter. 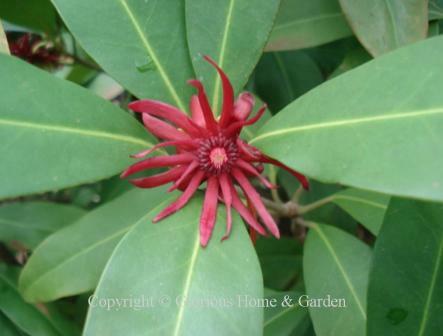 Some varieties such as 'Mountain Fire' also exhibit red new growth that fades to green to add to its interest. 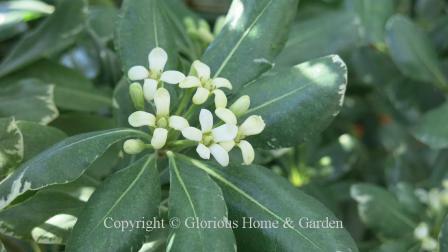 attractive evergreen shrub looks neat through all seasons making it very popular for foundation and mass planting. The creamy white blooms in the spring smell like orange blossoms. 'Variegata' has white-edged leaves. Prunus laurocerasus, cherrylaurel, Zones 6-8. This member of the cherry family is very popular for hedging. 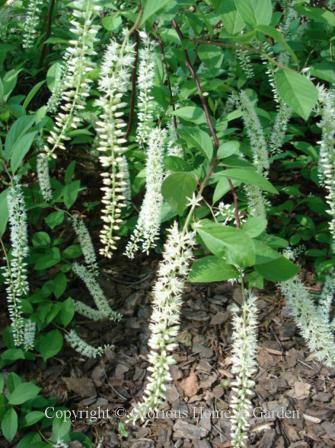 White flowers appear in spring and are followed by little dark purple "cherries" that can make a mess. Best not to plant where they can fall on cars! 'Otto Luyken' is shown. valued for the masses of orange-red berries it produces in the fall, but the white flowers covering the plant is spring are very showy also. Beware of extremely sharp thorns--can be used to make an impenetrable barrier. Also nice to espalier on a wall. 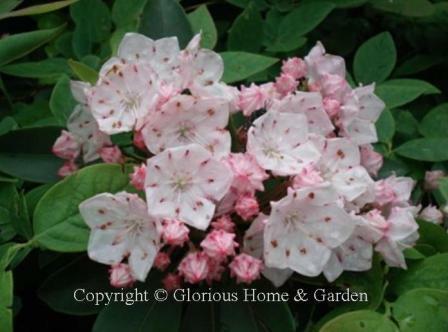 Click here for spring flowering shrubs R - Z.